The following is a conversation that I had with a friend recently about the relationship between the masculine and feminine in me. I found it insightful and decided to share it with you, as this is a theme that is very close to my heart and also an important one in Tantra. Friend: When you talk about the inner marriage.. what do you feel the masculine in isolation to essentially be and the essentially feminine? My feminine is intuitive... she feels life around her... she is directed by the heart. She feels the bigger space. her desires and motivations come from deep inside, and are a response to all she receives through her perception. She is receptive and perceptive in the subtle realms. What is your feeling when you have gone to far in the direction of the masculine...what happens to your awareness? Yes, an interesting experience. It feels like this. My masculine gets driven, competitive, goal oriented, starts to compare himself to others, and conjures up all sorts of imaginary goals. My feminine feels that she is alone - I feel lonely and feel that men have never been there for me - she starts to doubt herself and become insecure, she tries to win the masculine back but feels it's hopeless. OK. And what happens to the quality of your awareness when it goes like that? Friend:Sticky awareness.. get attached to stuff and aversive to stuff.. Friend: Is there such a thing as going to far into the feminine in your view? Friend: So becomes dreamy self-obsessive like? Shakti: :Yes... or insecure and insubstantial. I think masculine on his own can be as self-obsessive as feminine, though feminine is likely to be more internal with the obsession - self analysis - whereas masculine obsessiveness is focused on changing the external. Friend: Does the masculine have a role to play in the subtle, in meditations etc? In the beginning with meditation, it is useful to have some focus - such as the breath, or the bindu - for your awareness. This focus is held by the masclune, so that the feminine can relax into formlessness, into the subtle. For me it's like this: In stead of focusing on something, I sense the places where my will is creating a "self", and identity, a boundary between me and existence. And I very gently - very gently - just drop that insistence. Then meditation happens. 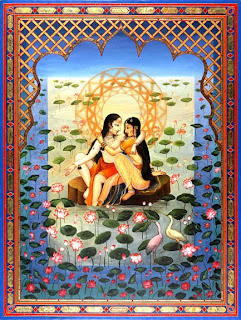 The masculine has to really cooperate and trust the feminine to go there. So, I would say that the inner marriage is essential for real meditation to happen. Can someone talk with the same clarity and deep insight from the male perspective? Thank you for the comment love. This conversation took place between a man and a woman.